… then welcome to the club. The amount of people who didn’t pass their driving test first time in some areas outnumbers those who did two to one. The key thing to remember is that if you did not pass your driving test first time, then you are certainly not alone. It is most definitely nothing to be embarrassed about. So, don’t give up, book a few more lessons, and book that second test. There is one benefit of taking your driving test a second time – you simply will not be as nervous as you were first time around! The day of your second test will not be as daunting, and that’s guaranteed. You will know mainly what is in store, and there is now absolutely nothing on the test that will hold any surprises for you. If you don’t pass first time, then you are obviously going to feel disappointed, especially if a number of your friends managed to pass on their first attempt. There are plenty of reasons why you may have failed – perhaps you didn’t get enough sleep the night before, or you just felt too nervous on the day. Not everyone is the perfect driver every single day of their lives – not even people who have passed their test and have been driving for years. 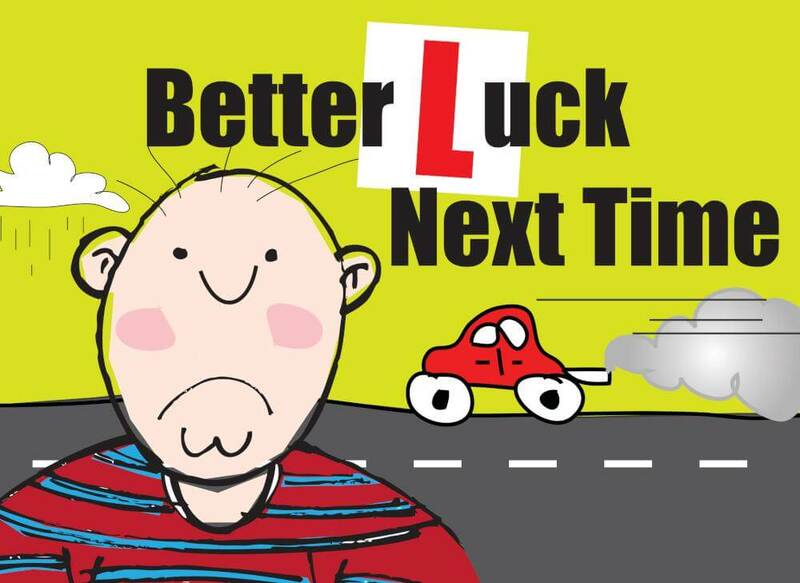 Remember that you took driving lessons and your driving test in order to enable you to be able to drive. You cannot drive legally without a licence, and you cannot obtain a licence without taking your driving test. Just think of all that time, effort and money you’ll be wasting if you don’t take your test again. Most people who want to learn to drive do manage to pass in the end, no matter if they pass first time, second time, third time … one person eventually passed on their forty-eighth attempt! Once you commit to retaking your test, well done! No one likes a quitter! Don’t be tempted to take your lessons leading up to your next test for granted. You will have failed your first test on something. Take the time afforded to you to practise what you failed on. The more you practise, the better armed you’ll become not to fail for the same reason. Make sure you keep taking driving lessons with your instructor – don’t just fill up the time until your next test driving with friends and family. If you’re letting things slide, then your instructor is trained to spot them. Will your friends notice that you’re not checking your mirrors enough? Or that you are braking too late? Remember that failing your driving test first time is never the end of your driving career, and it actually puts you in some very illustrious company. The 2009 World Formula One Driver’s Champion – Jensen Button – failed his first test too! With over 100 years of experience in teaching pupils to drive throughout London, Kent & Surrey, we can help you pass your test whether you are 17 or 70, male or female, nervous or not – we have the know-how. Call us today on 020 8166 5678 to speak with our helpful team to discuss the options available to you.